I will attempt in this article to give some ideas to help in the set up of a small recording studio control room, or a video editing suite where audio needs to be monitored. I will try to cover just some pretty basic advice here. It’s not intended to be a comprehensive guide, nor one designed to advise those with large professional studio control rooms, or surround sound Dolby mixing studios. It’s more aimed at the home or project studio, or small video production suite. Most people with small studios and suites don’t have the luxury of spending large amounts of money on having a purpose built room designed by an architect in conjunction with an acoustician, and are in the position of having to make the best of an imperfect situation. When we mix music or any type of audio, it’s not only the speakers, but also the room comes into play coloring what we hear. If the room acoustics are poor, it can radically change what we perceive we are hearing from our speakers. A song or a film scene mixed in an inaccurate room may sound fine in that one room, but when taken to another room may reveal serious flaws in the audio that were masked by the first room, or we may have mixed the sound to compensate for an inconsistency in the sound of that room. In the worst cases a mix may fall to pieces entirely, or may be severely bass heavy, or bass light when played back in a different room. A common scenario ( particularly in small rooms) is problems with the bass frequencies. Certain frequencies may disappear almost entirely, while others are enhanced. If we mix based on these inconsistencies, we may find ourselves turning up ( or turning down) the bass frequencies to compensate for what we are hearing. If we then take the resulting mix to a different room, with different characteristics to listen to it, we can discover that the mix is completely wrong. It may over or under emphasise the bass. Different parts of a room may display different responses to bass frequencies. For example, in one corner of the room a 100Hz frequency may seem quite loud, while in the middle of the room it may be almost inaudible. However, it’s not only low frequencies that can suffer in a poorly treated room. High frequencies may bounce off walls and cause reflections or echo that can also mask the true sound. Studio monitor speakers are available in many different sizes. It is most useful to at least have a pair of near-fields monitors. Near-field means they will be set up in close proximity to the listening position. Speakers designed for near-field monitoring are most often seen ranging from 5 to 8 inches across the main woofer cone. It may also be useful to have some additional smaller speakers, (and even one set up as a mono speaker to get a second or third reference from), but our good quality near-fields should be our main source of reference. I would avoid the addition of a sub unless you have a very large and well treated room. In order to mix with accuracy, it is important to have speakers that are relatively flat and uncolored in their sound, as well as having a good frequency response. If you are mixing audio for a film on small computer monitors, you cannot expect to achieve accurate results. For example, if you have a scene where there is the sound of a heartbeat, on larger full range monitors the sound may be loud and full, but on small computer speakers it may almost completely disappear as most of it may lie in frequencies below those which the speakers can reproduce. Try to avoid speakers that are rear-ported if they are going to have their backs positioned near a wall. The wall will stop the ports from working correctly, and the result would be uneven bass response. Also avoid placing the speakers in the corner of a room, as this will increase the bass response and lead to inaccurate perceptions of the low frequencies. The ideal positioning of the speakers is to have the listener and the speakers set up in an equilateral triangle. If the speakers are set up too far apart, the result will be a “hole-in-the-middle” phenomena, which will make the stereo image impossible to gauge accurately. The speakers should be set at the same height as each other, (not one positioned higher and one lower), and aimed at the ears of the listener. Stand the speakers up vertically rather than laying them down horizontally, point them in toward the listener, and if necessary, angle them downwards towards the listener. The aim is to get the frequencies being emitted from the tweeters and woofers of each speaker to arrive at the listener’s ears at exactly the same time. Lying the speakers on their sides would compromise the stereo image, which is why you should have them standing upright. Try not to have your monitoring environment in the corner of a room, and ideally have them set up to fire down the longest axis of the room. The latter recommendation is specially significant in smaller rooms. It is also important to avoid having hardware, like computer screens or other equipment, situated between you and the speakers. Having the surface of the desk or mixer significantly lower than speakers to avoid strong sound reflections from bouncing off the desk and back at you is also a wise thing to do. Indepth and complicated formulas for room treatment is beyond the scope of this article ( and likely beyond the budget of many prospective home studio, project studio or edit suite owners), but I will give you some basic helpful tips to improve the sound of the room you are working in. For a start, sit in the mix position, ie place where you sit and listen when you are mixing or editing, and clap your hands once. Observe what you hear. Likely it will be a series of short fluttering echoes, rather than a single sound. These echoes are undesirable, and if they are very obvious, they tell you immediately that there are problems in the room that need to be addressed before you have any sort of monitoring accuracy in the upper frequencies. Sound waves reflected from surfaces in the room combine with the direct sound. Reflections that arrive within 20-65 milliseconds after the direct sound arrives, will affect the tonal balance that you hear, because you will perceive them to be being part of the direct sound. Some frequencies will reflect from the walls more than others, which means that the overall tone that we hear will be affected. Various materials absorb different frequencies in varying amounts. Walls that are covered in carpet would absorb high frequencies but not low ones. Egg cartons also only absorb high frequencies, so a room covered in egg cartons will likely have very dampened high frequencies, but with little or no impact being made on the lower frequencies. When you listen in a room like that you will hear the direct sound from the speakers, plus the reflected sound of the lower frequencies from the walls. On the other hand, in a room that is covered in wood panelling, the sound you are likely to hear may be overly thin and bright, because some of the bass is absorbed by the vibrating wooden surfaces, whilst the treble is reflected from those same surfaces. In an ideal room all the frequencies would be absorbed evenly. Again, sitting in the mix position, play some reference music that you are familiar with, perhaps a range of commercial music that you are familiar with. Listen carefully to what the bass does. Can you hear all the bass notes evenly, or do some disappear while others appear overly loud? If you need to constantly adjust the bass controls when listening to the different material, it will likely be showing you that you have problems with the bass response in your room. Next, move around the room and listen to the material. Does the bass sound louder in some parts of the room than in other parts? Do some notes boom loudly while other bass notes seem to disappear? If this is the case, then you have what is known as room resonances or “standing wave”problems. In rooms with parallel walls, standing waves occur when the distance between the walls equals half a wavelength, or multiples of that half wavelength for any given frequency in the audio spectrum. When that distance is equal to half a wavelength, the frequency is known as the fundamental. The standing waves will occur at multiples of the fundamental frequency. So, for example, if the room has a standing wave at 50Hz, they will also occur at 100Hz, 200Hz, 400Hz etc. Small square rooms are the hardest ones to deal with. Room acoustics also affect the time that a sound takes to decay. A short note may echo around the room causing it to sound much longer than the original recording. Whilst the control room should be reasonably dead, a totally dead room is not comfortable to listen in, however. In our control room we want a typical reverb time that is similar to the average living room. This is usually around about 0.4 seconds. While using nearfield monitors does make room acoustics a little less important, it is still wise to do some basic treatment of the room acoustics. To prevent sound reflections from occurring behind the speakers, line the wall with rigid fiberglass panels covered with muslin, bed sheets, or other suitable material, or acoustic foam. Even standard non acoustic 1” foam, covered by a duvet inner and a sheet and hung on a wall behind the speakers will work wonders to improve the perceived stereo image and depth of the sound you hear from your monitors. Ringing will be less, transients will appear sharper, and there will be less boominess appearing to come from your speakers. Basically, different thicknesses of foam will affect only frequencies above a certain point related to the foam’s thickness. For example, a piece of four-inch-thick (100mm) foam that is attached directly to wall will only absorb frequencies above 200 or 300Hz, and two-inch foam ( 50mm) is only going to absorb the frequencies above a 400 or 600Hz range, depending on the density of the foam. One inch foam (25 mm.) is only effective above 800 or 1.2 kHz or so. On the other hand, rigid fiberglass absorbs frequencies to about an octave lower than foam, so a two inch sheet of fibreglass will absorb to about 250Hz, and a four inch thick sheet will go down to about 125Hz. Another point to consider is that placing foam or rigid fiberglass absorbers a few inches away from your wall increases their effectiveness at low frequencies. If you place a four-inch-thick (100mm) rigid fiberglass absorber four inches away from a wall, it does almost as good a job as an absorber twice it’s thickness. Placing some absorbent material above the monitoring position is a good idea to prevent sound from bouncing between the floor and the ceiling also. 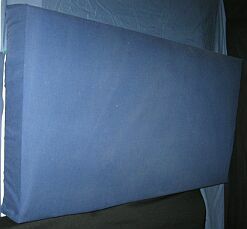 You could attach some foam to the ceiling, or suspend a doubled over duvet inner or something similar from the ceiling. Remember that having some air space between the treatment material and the ceiling will increase it’s effectiveness. Having some absorbent material on the walls ( or hung a few inches away from the walls) adjacent to the speakers is usually effective in helping to tame the listening environment at the listening position too. Heavy drapes away from the wall that the speakers are firing towards can also be helpful in taming high frequency reflections. Having them a few inches away from the wall ( or window) increases their effectiveness. Hanging packing blankets behind dapes is another affordable and useful idea. Dealing with problem bass frequencies in a room can be quite an issue, because effective absorbers need to be pretty large, but having some type of bass traps in the room is pretty crucial for the accurate monitoring of low frequencies. People that are having difficulty hearing the bass in their rooms may wonder why on earth you would want to “trap” bass if you can’t hear it properly as it is. In reality, adding bass traps usually increases the perceived level of bass to the listener rather than reducing it. The nulls in rooms are caused by standing waves that are reflected from the walls. Because bass traps are designed to absorb rather than reflect sound, the reflections in the room are thus reduced, so bass frequency response becomes flatter, and in places where certain bass frequencies were previously cancelled, the addition of bass traps actually increases their level. The lower the frequency you need to treat, the bigger and thicker the absorber or bass trap needs to be. A rigid fiberglass panel is as effective as about four times the thickness of standard home insulation fibreglass in trapping bass. To deal with low frequency problems, there are a number of different methods that can be used, and there are various types of bass traps on the market, as well as various DIY approaches. A great advantage of using rigid fiberglass for bass traps is that they’ work over a wider range of frequencies than some of the other designs. 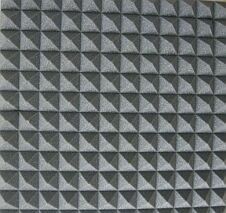 A bass trap made from this material not only traps bass, but can be used to absorb mid and high frequencies too. Having at least some sort of bass trapping in the corners of the room will be a big help. The scale of the discussion round bass trapping methods is too much to cover in this article, and I suggest you try and obtain some other reading material on this subject to study. 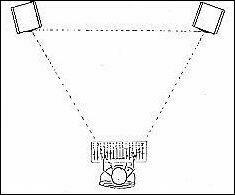 b) Position the listener and the speakers in an equilateral triangle, with the monitors aimed at the listener’s ears. c) Have the speakers aimed down the longest axis of a room, not across the longest walls. d) Place acoustic treatment on the wall behind the speakers, to the sides of the speakers, and preferably also above the monitoring position. e) If possible install bass traps in the corners of the room and/or along the back wall. f) Avoid any protrusions of hardware between the speakers and the listener. 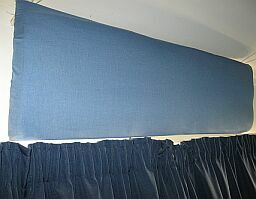 g) Use heavy drapes, duvets, or packing blankets to help tame high frequency reflections from walls or windows. This entry was posted on Monday, February 11th, 2013 at 11:03 pm	and is filed under Tutorials.